I'm late on this one, I know. The last couple of days I have felt sort of wishy-washy, and I have skipped the gym in favor of napping and housework. This morning though, Noah and I got up bright and early and headed to the park with the jogging stroller. He was crabby, so we only did 2 km, but it still felt good to get out and move - the temperatures are supposed to be in the low 100°s later today, so I'm glad we got some exercise and fresh air while it was still tolerable outside. My weigh in yesterday was mildly disappointing. When I got back from Connecticut, I was 318, and then the following week I was at 314. The week after that, 314 again. Last week, 310. And yesterday, 310 again. There seems to be a pattern, and even though it is progress in the right direction, it bugs me. I am still now, five years into it, so attached to numbers as sole measures of success. So, I decided to do something to measure my success in another way. I got to thinking about making some sort of huge plan the other day. I had to stop by the car insurance office to sign paperwork, and on the way back, I stopped into visit a friend and her young son. We were chatting a bit, and I don't know how, but eventually we got on the topic of fashion. We talked about our individual styles, and I told her about how, when I was big the first time, I pretty much wore jeans every day, and when I found a shirt that I liked and that fit, I would buy it in a dozen different colors. At my smallest, I was overwhelmed with choices because I had never been able to buy things that were not tucked away in the back corner of the store. Now, pretty much everything I wear is from ModCloth - they make the cutest dresses in a wide variety of sizes, from extra smalls to 4XL's. And somehow we got to the subject of shoes, and she recommended a brand that she loves. I told her I would look into it because I needed some new shoes anyway, and she said "Good - I hate your tennis shoes." To be honest, it floored me. I don't think I've ever noticed anyone's shoes before, let alone thought to comment on them. I kept it cool and gave an explanation - they are running shoes, I bought them when I was trying to be a runner again but kept wearing them so that it wouldn't be a waste of $150 - but on the inside, I was really sort of hurt. It was not a comment I expected, and especially not from her. I stopped at the grocery store on the way home and binged while driving to pick up Noah from daycare, all the while thinking wow, there is not a single inch of me that is free from judgment. I'd been doing so well, too. I've talked about this a lot here before, but it's so interesting to me that I am struggling so much this time around with keeping my eating in check. The first time, the food was easy. Exercise was easy. The greatest challenge that I faced the first time was sorting out my identity. I'm anticipating it being an issue this time as well, so I am doing what I can now to ease the transition back into my smaller self. But the first time, I hadn't expected it at all, mostly because I hadn't expected success. So that night, I sat down and thought about my identity - how I see myself, how others see me, how I want to be seen. People may look at me and see a large person, but that's such a small part of my story. I used to be bigger. I used to be smaller. I used to be a lot of things. Right now is what matters, though. And I'm a mom, and a hard worker, and a friend, and a sister, and a daughter. I want to be seen for those things and not just for my size. And so I am working to be smaller again, and healthy again. And to help with that, I'm getting back to another "used to be." I thought about it, and I remembered that I had talked about it with my dad a little while ago. I told him that when I was actively living healthier, going to Connecticut was easier because I had races during or immediately after the visit, so I knew that I didn't want to commit any behaviors that would interrupt or get in the way of those goals. 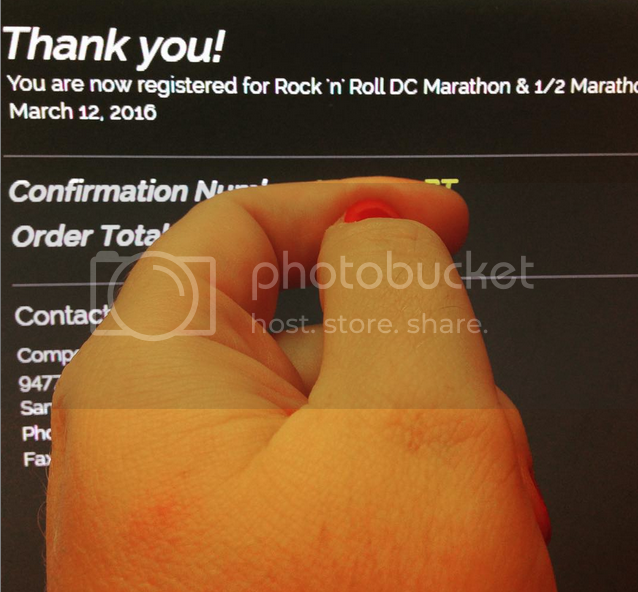 "So register for a race," he said, simply and matter-of-factly. "If you have to walk half of it, or if you have to walk all of it, just get that goal on your radar." Training starts Monday with Couch to 5K - I wanted to wait to get back into running until I was at that 295 milestone, but … why? That number was significant the first time around, but this is now and this is what needs to be done. There's 35 weeks until race day - plenty of time to be race-ready. I'm looking forward to sharing my experience relearning how to run and training for this event. It's funny, the moment I decided to register, I felt ... different. My ex-husband had this uncanny knack for making me hate every single thing that I once enjoyed, and so for the last few years, I've gone back to being that person who laughs and says that she only runs when she's being chased. But that's not who I am, it isn't how I see myself. That's not the identity I want for myself or that I want to portray to my son, to my family and friends, to my colleagues, to the world. I loved being a runner, and I want to be one again. 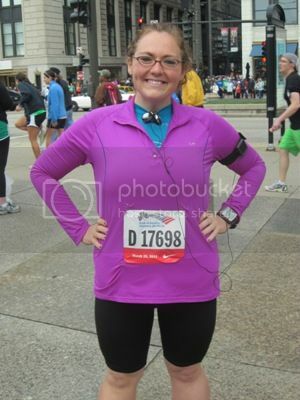 And as soon as I signed up for the race, I felt that surge of love again - self-love, self-confidence. I've been trying some new stuff lately and I thought I'd share. I've been trying to post more to Instagram, which is fun and I love the feedback, but sometimes seeing other people trying stuff makes me curious about it, and that can be good or bad. 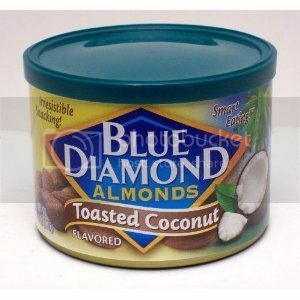 I found these coconut almonds at a shop in Connecticut and got them for a healthier choice to snack on for the ride back South. (Then I packed them up and forgot about them.) They're pretty good - sweet but not overly so, and no artificial aftertaste, which is surprising because they're slightly sweetened with stevia. These, on the other hand, have a really icky fake aftertaste to me. 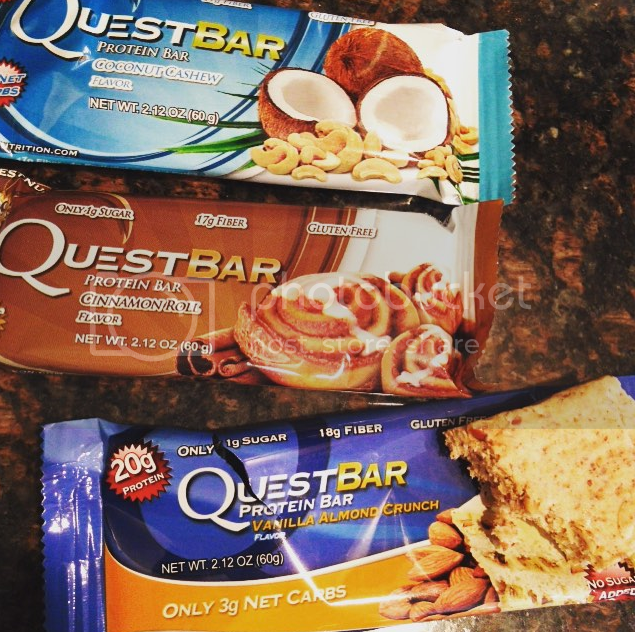 The coconut cashew one is the only one so far that hasn't tasted gross to me, but even still, they're pretty expensive for something I'm not entirely crazy about. I looked on Pinterest and found some recipes for homemade protein bars, so next month when I take Noah for his haircut (the closest kids-only salon is an hour away - if anyone's looking to start that kind of business, Myrtle Beach needs you desperately), I'll stop at Trader Joe's and Whole Foods for any ingredients I can't get here. 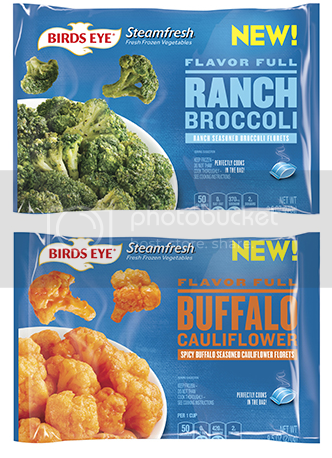 Birds Eye has these flavored veggie blends now - these were the two I tried. They also have barbecue corn and teriyaki broccoli, but (a) I don't eat corn and (b) I couldn't find the teriyaki one. I probably won't look for it, though ... the cauliflower was delicious but a TON of sodium, and the ranch one had no flavor at all. 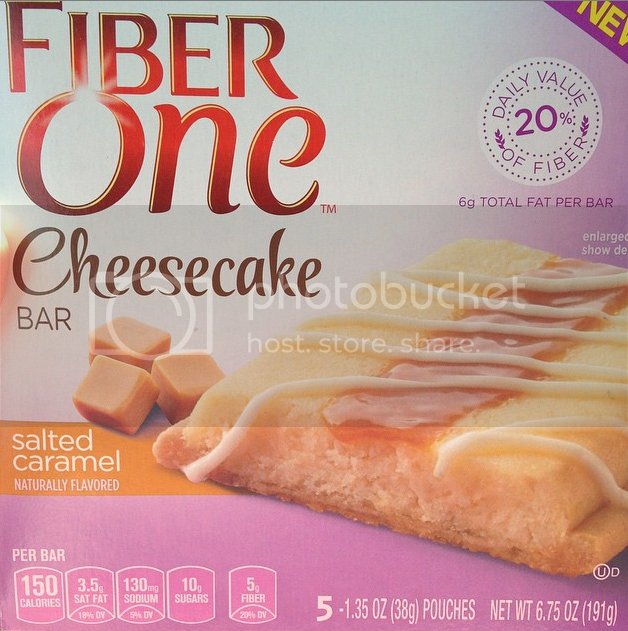 Fiber One stuff can be hit or miss. I remember the first time I lost the weight, making Hungry Girl recipes and they all called for Fiber One cereal crunched up instead of breadcrumbs. Oddly enough, it worked. The bars, though, can sometimes have a chalky taste. 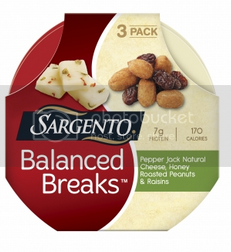 These were pretty good, and I might get them again if I'm craving something sweet that won't tempt me to binge (that's a mistake you only make once). I will say, though, I sent a letter to the company that makes them (General Mills) saying that I thought the packaging was kind of deceptive. I didn't take any pictures of the actual bar, but it seriously did not look like the luscious treat on the box. It was good, but not quite what they portrayed, I think. These were an on-the-go grab - Noah and I had gone to the beach with friends and stayed longer than we had planned, so we had an unanticipated dinner out. I had half a chicken quesadilla, shared with Noah, then grabbed these from the store before driving the 45 minutes home. It's great for me because sometimes I have trouble with portion control when it comes to cheese. I had one this morning, actually, after the gym ... I ate the nuts and raisins while my scrambled eggs cooked, then I added the cheese to the eggs. Probably not the use they intended, but it works for me. It seems like especially in summer, we all miss ice cream. 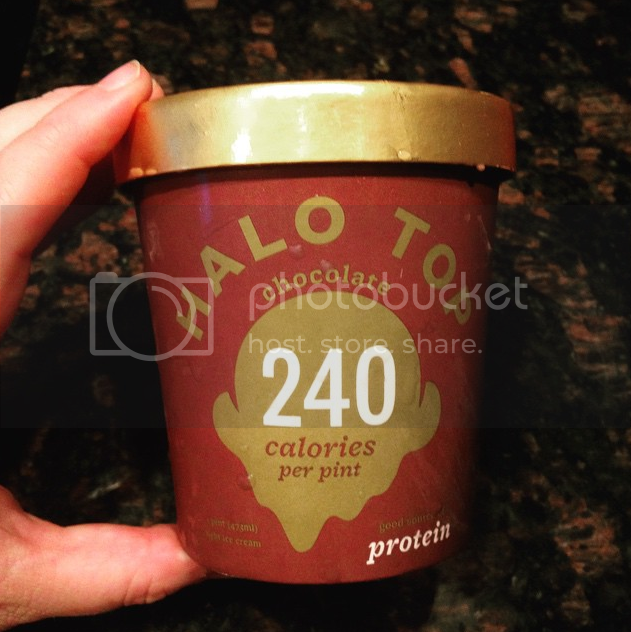 I've seen everything from the blended frozen bananas (excellent) to Arctic Zero (haven't tried and don't intend to, I've heard such lousy reviews), to now this: Halo Top Creamery has a protein-packed ice cream that's 240 calories/24 g protein per pint. I had half one day and half the next, and while it wasn't bad, it also really didn't remind me of ice cream. Honestly, it reminded me of the Fudgsicles my Papa used to pass out after dinner in the summertime. So while grocery shopping this week, I got a box of those instead. 100 calories each, and a box of 12 cost the same as the pint of Halo Top. Less protein, of course, but I'm not really struggling with my protein intake. What about you? What are some new products you've tried lately - loved, hated, in-between?